The Three College Observatory is located in central North Carolina approximately eight miles south of Burlington. On a straight line between Greensboro and Chapel Hill the observatory is at about the midpoint. The observatory may be reached from Greensboro in approximately 45 minutes after a drive of some 33 miles. The building is situated in the Cane Creek Mountains of Alamance County, although some would say that these are mountains only in the loosest sense of the word. 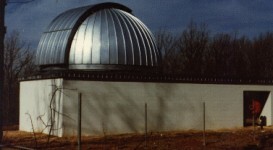 The site was selected because of its proximity to the Greensboro metropolitan area as well as the reasonably-dark skies to the south of the observatory. Settlement in the immediate area of the observatory is mostly of a rural nature, and the site is heavily wooded. Growth along the I 85 corridor 8 miles north poses growing problems with light pollution, but is presently mostly an annoyance. As a dark sky site this location poses an excellent compromise between the need to be close to urban centers and the desire for very dark skies. For a detailed map and driving directions to reach the observatory click here.